Massage has gradually become an important part of life. The fast-paced environment where everybody is busy running up and down has made massage products attractive. You cannot enjoy the fruits of your hard work with pain, fatigue, and stress. You need to get relief from those tired feet so that can face another day with revitalized energy. There are numerous massage products in the market that choosing the right one is usually an uphill task. Very few massagers in the market massage all the sides of the feet. Fortunately, there is Ucomfy shiatsu foot massager that combines heat and massage action on the top and bottom of the feet. Unless the doctor advises you otherwise, foot massagers are good for you. Simply, the devices are a source of total relaxation after you have spent the whole day making a living. The best shiatsu foot massager is good for individuals of all ages, and they have no harmful effects on the body when done the right way. Research shows that a ten-minute massage not only relieves foot pain, but it also increases blood circulation to all parts of your feet. That does not mean it is good for only those with particular conditions. Your physician can even recommend a foot massager to treat foot troubles that may be affecting your daily activities. The most common conditions that you will need a foot massager include plantar fasciitis, neuropathy, and other medical conditions. Especially with heel pain, the device combined with other exercises brings the necessary relief to ensure you live your life as you should, without pain. And of course, the massagers are good for older citizens. The aged know how debilitating aching joints can be. Not only the joints but old people are also vulnerable to a number of conditions associated with restricted blood flow. A massager will improve blood flow and release any tension making them healthier and strong. In most cases, the physician will recommend a massage to ensure the old maintain their health. It is necessary that oxygenated blood travels all parts of the body unrestricted to provide energy, healing and remove toxins. You have probably heard that feet have particular points that correspond to different parts of the body. Massaging your foot eases the pain on the corresponding body parts especially for these old people and those living with particular medical conditions such as diabetes. If a person with diabetes, the shiatsu foot, and calf massager enhances blood flow to the parts that the condition affects. A research study in the Netherlands found that a foot massage three times daily brings down blood pressure. This is especially true for individuals that used a foot massager targeting your feet’s pressure points. The rubbing action is responsible for easing the stress and pain that leads to a variety of health problems. The improved blood circulation is essential for a healthy heart. For some people, the appearance of varicose veins is not something that they are comfortable with. A few minutes of the foot massage will improve their appearance. Choose your foot massager well depending on their heads and features, and you will live your life stress-free and pain-free. Know how to use foot massagers effectively to accrue all the associated benefits. Even without the Ucomfy foot massager manual, the product comes with a control panel that is easy to comprehend. You just read the controls and vary the device according to preferences right off the box. The unit is not only portable but also has a solid construction. Cheaper brands are made of poor quality plastic that reduces the life of the product. You will have this product for a long time. This model offers an enhanced experience as it massages the top and bottom of your feet. Cheaper products will not offer you this. The cloth lining the interior has a zipper and can easily remove it. You can clean it and replace it for a hygienic massage therapy. This feature is especially helpful for those that share the device at home. The massager is available in two colors; red and silver. Ucomfy shiatsu foot massager also comes in two sizes that you can choose from; oval and round. The massager has five different levels of massage with P1 being the lowest and P5 the highest. The device has a sleek appearance. It is aesthetically appealing and is portable and light. When you are done with it for the day, you can easily slip it under the bed. 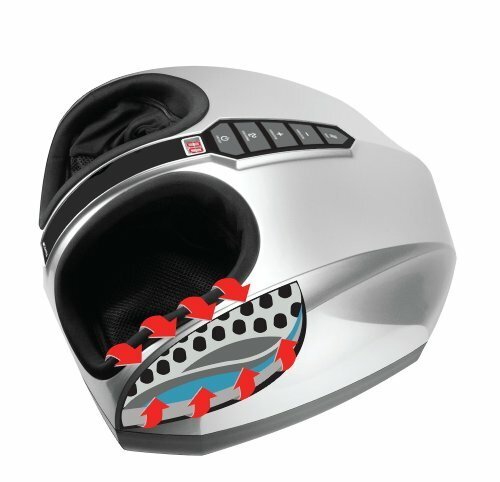 The foot massager utilizes heat, vibration, and air pressure to rejuvenate your aching feet and tired muscles. Heat loosens the tissues while vibration enhances blood circulation. Air pressure helps in deep massaging and targeting the pressure points. 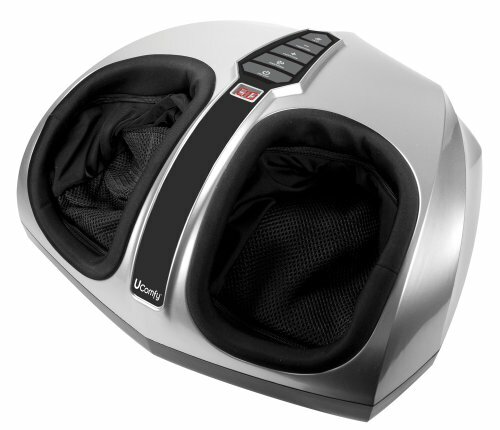 Ucomfy shiatsu foot massager is among the few massagers in the market that offer an all-around massage for your feet. All you need to do is slip your feet inside the device and receive all the pleasure it provides. The model has sufficient versatility to ensure you fine tune it to your liking. With five intensity settings, you can vary the working of the machine until you reach a comfortable level. You can increase the intensity of the foot massage by just tilting your feet. It is, however, important to begin with low settings and increase gradually to a comfortable level. The device can be a little intense for individuals with sensitive feet but need not worry about it too much. You can wear thick socks or start at the lowest settings. Even though the shiatsu foot massager with heat comes with the dimensions of 17.7 x 15 x 18.1, it weighs about 12 pounds. In all honesty, this is a portable model. This means that you can put it in a large bag and take it with you. The downside is that it cannot fit in most suitcases due to its large size. The heating is just right. It does not get too hot to use, but it is sufficiently warm to offer the necessary comfort and relaxation. The sound that machine makes is low and will not disrupt you when doing other activities such as reading a book. You can use in an office setting as the low rumbling sound made the motors will not be a source of irritation for others. The 15-minute timer switches the product off without making any annoying beeping. This means that you can enjoy the pleasure the machine provides without having to worry about dozing off. However, the timer informs you of the time you have remaining, so you are not caught off-guard. Ucomfy customer service is fairly responsive. Even though some online reviewers accuse them of being unhelpful, they are quick to respond to queries. Regardless, there is still room for improvement. If you have large feet, the massager will be uncomfortable. It will feel restrictive, and when turned on, you feel a pinching sensation from the pressure it exerts. Extra-large feet will not go through the machine. Despite the five settings the model comes with, it does not have program presets. There is no possibility of making your own program that you can turn on. This means that you have to operate the controls every time you need to use the device. You have to admit that the bending in an attempt to vary the controls is quite tiresome. Many foot massagers with heat do not have a functionality to adjust the heat, and this model is no different. There is no option to increase or reduce heat and have to get used to the heat on offer. What you have is just an ON/ OFF which is not of much help. The selling feature of the product is that massages the top and bottom of the feet. However, that is all there is. The machine does not massage the side of your feet and barely touches your heels. If you have heel pain, you might want to consider other massaging products in the market. Ucomfy shiatsu foot massager is among the few massagers that cover the whole foot during the massage. However, it does not cover the legs and will need products such as Ucomfy leg and foot massager – bed bath and beyond. You will need a separate device for that. Even though the model comes with varying massage actions and intensity settings, it is a still a basic unit. It is for those that are comfortable with a product that serves the basic massaging needs, nothing else. Still, it is a good acquisition. It is better by far than those cheap models you see in the market.